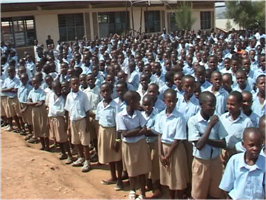 The Anglican Church of Rwanda Kigali Diocese (EAR/DK) contributes significantly to the education of Rwandan children through its 37 schools, including pre-schools, primary schools, secondary schools and a vocational training centre. The current EAR/DK leadership sees the opportunity to truly disciple children through education and recognizes EAR/DK schools are not yet fulfilling their potential for spiritual and educational impact. Over the past few years EAR/DK has made progress in better supporting school leaders, teachers, and parents—in an effort to deliver quality Christian education in their schools. Mission: To equip the people of God with knowledge, attitudes, skills and values for Christian Living, growth and service. In order to realize this vision, the Anglican Diocese of Kigali has defined the following objectives in education. These objectives try to capture the three major aspects of Education in the Church namely: formal Education, Theological Education and Christian Education. To educate a free Christian citizen who is liberated from all kinds of discrimination, including gender based discrimination, exclusion and favoritism. To contribute to the promotion of a culture of peace and to emphasize Rwandese and universal values of justice, peace, tolerance, respect for human rights, gender equality, solidarity and democracy. To dispense a holistic moral, through the promotion of individual competencies and aptitudes in the service of the national sustainable development. To promote science and technology with special attention to ICT. To promote vocational, technical and professional education. To equip the Church with Pastors well educated in theology. To eliminate all the causes and obstacles which can lead to disparity in education be it by gender, disability, geographical or social group. To ensure that education is available and accessible to all Rwandese people. To improve the quality and relevance of education. To promote the teaching of religious education and Christian values in school. To inculcate in children and sensitize them to the importance of environment, hygiene and health and protection against HIV/AIDS. To improve the capacity and competencies for planning, management and administration of education. Primary, Secondary, university, Vocation training centres, School chaplaincy, relations with ministry of education, Training equipment, teachers, Compassion projects. Kigali Diocese has 19 Primary Schools, 6 of them has 9 years basic education, 3 secondary schools and 2 Vocational Schools.